The California Association of Highway Patrolmen has set up a memorial trust fund for the Camilleri family as follows. One hundred percent of all donations received will go directly to the family. The CAHP Credit Union is covering all processing fees and administrative responsibilities. On the evening of December 24, 2017, California Highway Patrol Officer Andrew Camilleri and his partner, Officer Jonathan Velasquez, were stopped in their patrol vehicle within the reverse gore of the Winton Avenue onramp to I-880 southbound as part of the CHP’s Maximum Enforcement Patrol over the holiday season. At approximately 11:20pm, a Cadillac sedan driven by a 22 year old male drifted off the highway and struck the patrol vehicle from behind. Both officers and the driver of the Cadillac were transported to the hospital. Tragically, Officer Camilleri’s injuries were not survivable. Officer Velasquez was treated and released from the hospital. The driver of the Cadillac has been charged with driving under the influence. 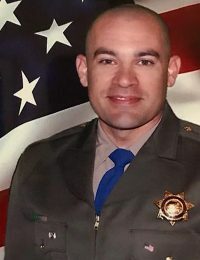 Officer Andrew Camilleri, age 33, began his career with the California Highway Patrol on August 22, 2016. He is survived by his wife, 12-year-old daughter, 6-year-old son, 2-year-old son, his parents, brother, and sister.